Photo’s of the long route to Luang Prabang and cycling to Vientiane are here: Nong Khiaw to Luang Prabang and Luang Prabang to Vientiane. Which route would you take to Luang Prabang? Well we agreed on the long one… right. Finally we decided and for more reasons. 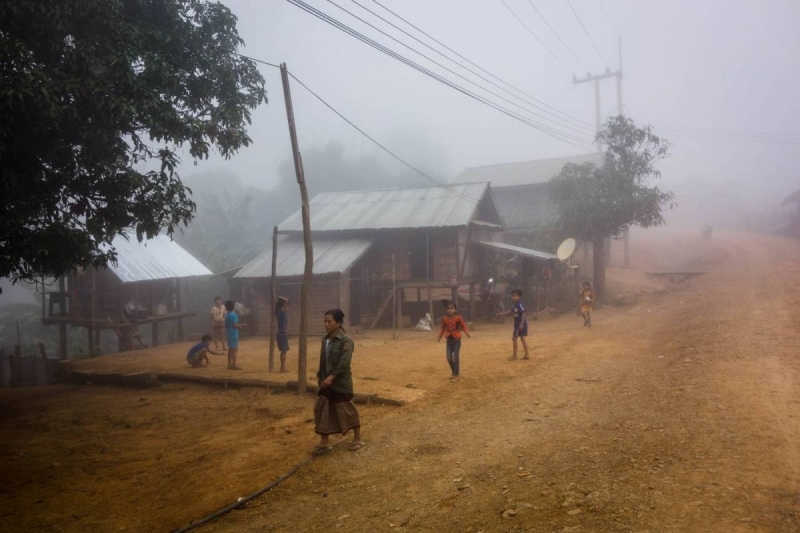 11 years ago Martin had visited a hill tribe in the mountains near Luang Prabang we thought it would be fun if we could find the family where Martin had stayed. This was a long shot and one of the reasons to pick the long route. We mapped out the route and noticed this remark on the Openstreetmap “very steep road”, never seen that before on the map. We had spoken with a lady who works for a tourist company here in Laos and she mentioned a 12km steep down hill so we thought that would be it.. Well that was not entirely the case and you will get to know why later. We cycled out of Nong Khiaw. Just outside of town we met a German family in their massive campervan, they had driven here through Russia, Mongolia, China. We said goodbye as we needed to get going. Soon enough the first climb started, a 900m climb after the days of rest was a hard start. This was just the first climb of the day as after the top we would go back down and climb up another hill. We were used to this by now as Yunnan was the same. In one of the small villages where we stopped for a refreshment “cold coke” there were some people handing out glasses, after a chat with the pastor we understood that they were South Korean missionaries. We were still on the paved road and finding our camp spot proved difficult as there were no spots for the tent and before we knew it the sun was going down. We found a spot near a track down the mountain not as leveled as we liked but we were sort of able to sleep there. “This is our turn”, Martin said the following day at the intersection with a few small shops. We looked at the gravel road and we knew from the elevation plot that we would be riding on the ridge and going up and down for the next 100km. Let’s buy some bananas, we agreed, and get on with it. We were on the top of the mountain so as soon as we cycled on to the unpaved road we were met with some beautiful views. This road would eventually lead us to Luang Prabang, but now it was rural Laos we were meeting with. The villages were simple and the people shy, there were not many connecting encounters with the locals. We would stop and have a cold coke if available or this soy milk drink “Vitamilk” which we had learned to like and has a reasonable amount of energy. The villages were full of children, every household has a few and we have never seen as many pregnant women as we have seen here in Laos. In early morning and just before it would get dark we would see villagers going to and coming back from the fields where they work. Bags were being filled with rice and transported to the villages. The day and a half on top of the mountain we were accompanied by motorbikes, we saw very few cars which took this ‘shortcut’ to Luang Prabang. The villagers wash themselves at the communal water source. Men in shorts, women in sarongs and children usually naked. It is a different and public sight in an otherwise reserved nation of people where it is common to cover shoulders and knees. We were told by a man who was loading his motorbike with two bags of rice at a time and spoke a little English that he was bringing the rice back to his home in the village. 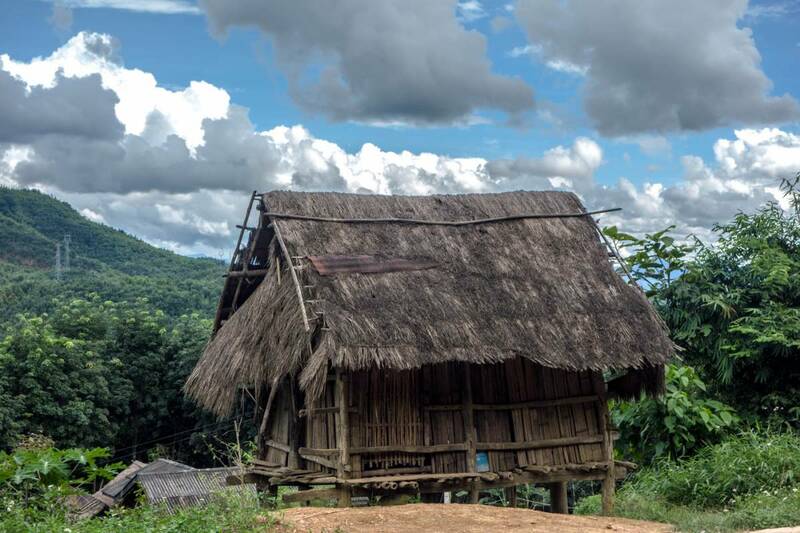 In his village there were Hmong, Khmu and Lao people living together. Although the road was high-up on the mountain it was no easy ride. The road followed the ridge up and down and some sections were very steep. Villages were located on top of the mountain and our road would wind itself up which made for slow going through the villages dodging chickens, pigs, small children and staying on track on the gravel path. At times we had to push because there wasn’t enough grip and the gradient was too steep. The last day on top of the mountain we had a small lunch break at a village and went looking for a drink. Every village has a shop but we have been fast learners that we shouldn’t expect too much in terms of choice. Also most products in the shop are past the due date. The shops seem to cater for the people with a sweet tooth. While we were having lunch (bread, crackers and banana) we were observed by 16 pair of eyes belonging to children of the village. A guy on a motorbike stopped and engaged in a conversation with us and suddenly we were offered a sugarcane from the field for 3.000 kip, the local currency. The 17 year old guy was a skilled sugarcane cutter and taught us how to prepare and eat it. It would be a great snack for the next section. After spending the night on top of the mountain it was time to head down the 12 km steep section and meet the river. Mornings are usually foggy in the Lao mountains and we didn’t have an amazing view but the views of the days before had already been very beautiful. Down at the river there were more settlements, a few towns, larger school and more people. 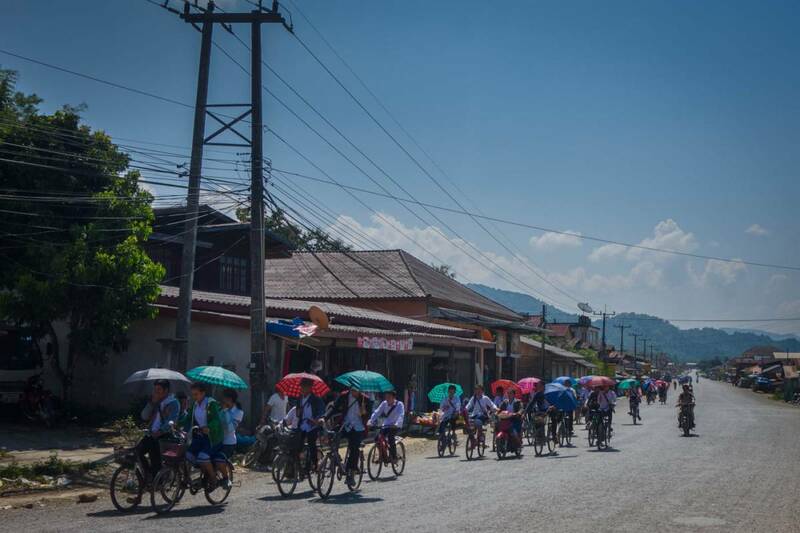 We were accompanied on the bikes by children going to and coming back from school in their uniforms and with umbrellas protecting them from the sun. 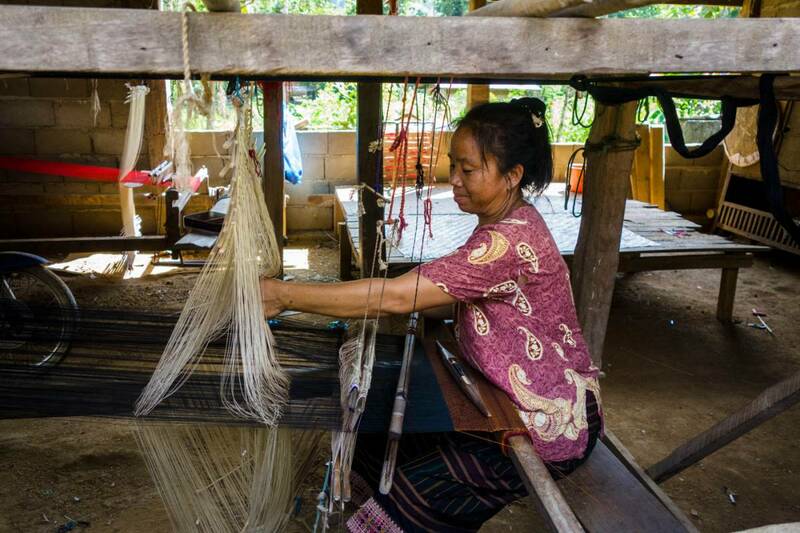 In a village where we stopped for lunch a woman was weaving and we watched her doing her work very methodologically. She must have been doing this for years and year because the sequence of actions was programmed in her brain. The weaving was very pretty. We had one more night before we would face the bustling city life again. After 10 kilometers the road turned from gravel back to pavement and we had a swift ride to Luang Prabang where we had a renewed acquaintance with the Mekong and were stunned by the amount of tourists, cafes, restaurants and English spoken. We visited the night market which we both had visited before and had definitely grown, enjoyed the cheap touristy cafe in a side street, met fellow bicyclists Aurelie and Yann from France and were able to add a jar of peanut butter to our panniers for lunch break at one of the shops across from Dara market. It is nice to have the ease of being a tourist but after three days of shakes, banana pancakes and avocado sandwiches we felt a dire need to be back on the road again. 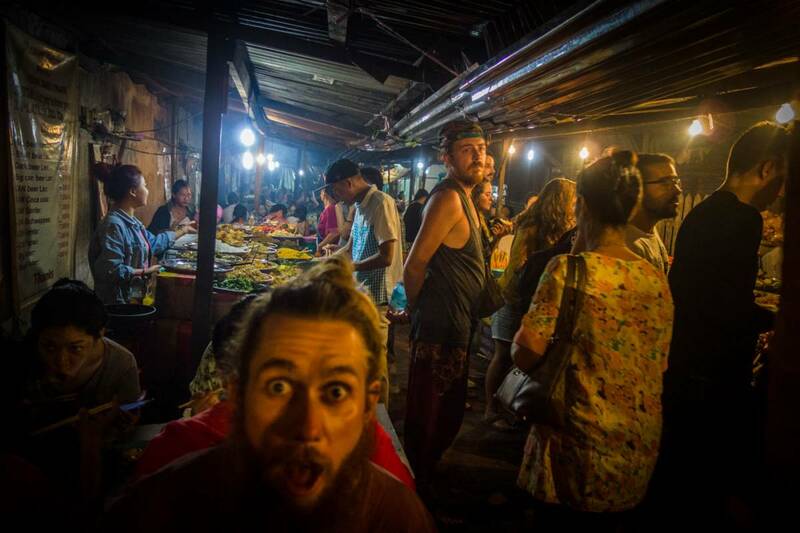 We have been reflecting a lot about our experiences here also being the second time we both visit Laos and until now it is the country on this journey where we feel we are strangers the most, there is the least local interested contact and (exaggerated) people are after our money instead of a meaningful experience. 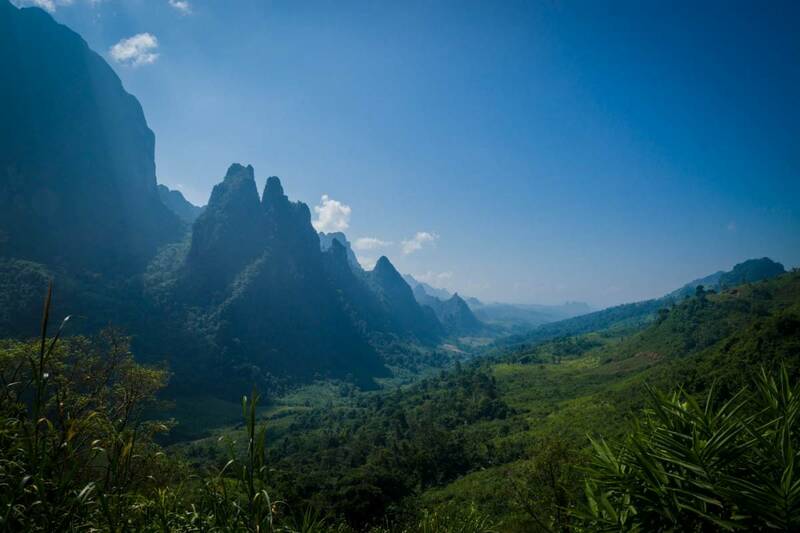 That said we have shared some nice moments along the way where we have been offered bananas and watermelon, so there is a hidden gem in Laos… It is just that the masses of tourism are crushing the gem. Out of Luang Prabang again there was the choice of a main road or smaller roads but considering time, the time we would use on visa in Vientiane and our schedule we opted for the most direct route with the least altitude meters. This meant we had two mountainpasses, both from 300 meters to 1200 meters and a small 250 meter ascent. The road was pretty, but especially the section between Phoukoun and Kasi was very beautiful with edgy mountains, beautiful sun, rice fields and great views. On Crazy Guy on a Bike there is a guesthouse that has become famous within the bicycle touring community. We missed the chance of staying there because we were too slow getting up the two mountains and it was getting dark when we had just another 25 km to go downhill, so we stayed in Phoukoun but it looked like a nice place. Price as of October 2015 was 80.000 kip. 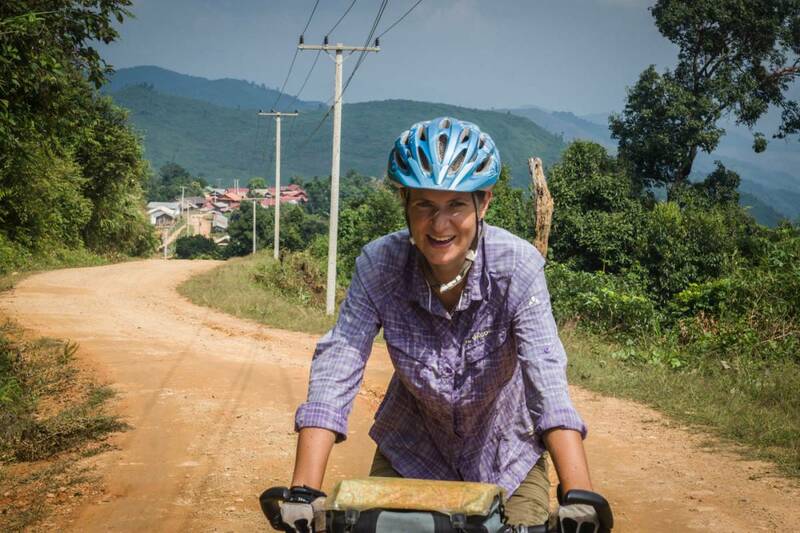 In Phoukoun we met a Canadian women who is cycling South East Asia with a friend. Instead we stayed at Nola Guesthouse in a small village off a side road between Kasi and Vangvieng which had been introduced to us by Eduardo, a Mexican cyclist we met on top of one of the passes. 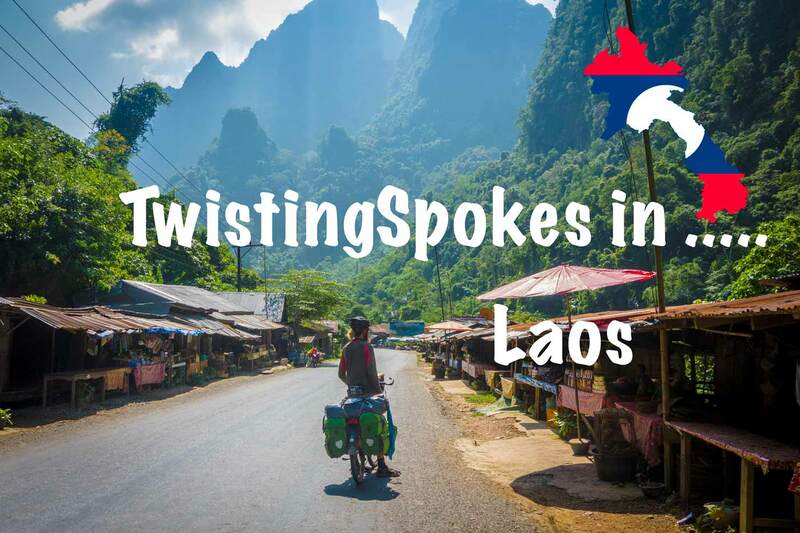 It is run by an Italian guy Michaele in cooperation with a Lao family and has a great location on the Nam Leak river and a pleasant atmosphere. On our way up a small pass while we stopped to have a drink (because we were sweating like crazy!) suddenly we had a cyclist riding up behind us. He was together with a friend and we rode up the pass somewhat together. 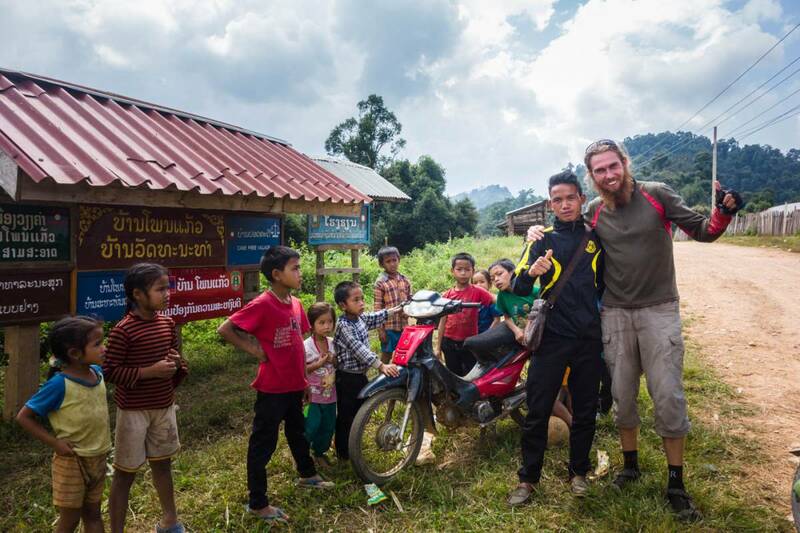 While chatting the men told us they were from German, 65 and 75 years old and that this trip, cycling from Chiang Mai to Ho Chi Minh had been a dreamtrip for one of them to do. It was a nice meeting especially because they had cruised down the hill faster than us and we saw them in the next village dancing to the music in a small restaurant having a good time 🙂 We headed to Vang-vieng where we were happy to find a hamburger and some WIFI. This town has quite a reputation so as quickly as we could we got out of this town which has been totally overrun by drinking, tubing youngsters we left. Back in the lower lands the temperature had gone up, the road was smooth and suddenly we were cruising. Unintentionally we had reached a section with no guesthouses and not so many places to camp so we decided to push on in the dark to find a scruffy guesthouse and totalled a 100km day. With only 100 km left to Vientiane we had been talking about taking it easy but the road was so flat that halfway the day we gave an extra push. Then got hung up to fix a flat tire and gave a final effort on the increasingly busy highway and made it to the city. Martin had been here before, Susanne hadn’t. Where before it was a city people would not go out of there way for, nowadays the city has a lively tourist quarters with many tourists and banana pancakes and shakes…. It looks like we will be here for a while to process our visa. Cycling into Vientiane looking for guesthouses we were stopped by this nice lady Trisha who recommended us to stay at Sport Guesthouse, a simple guesthouse in the main touristy area. 100 meters from here there is a cheap outside restaurant with decent sized local meals for a good price, always important for cyclists. 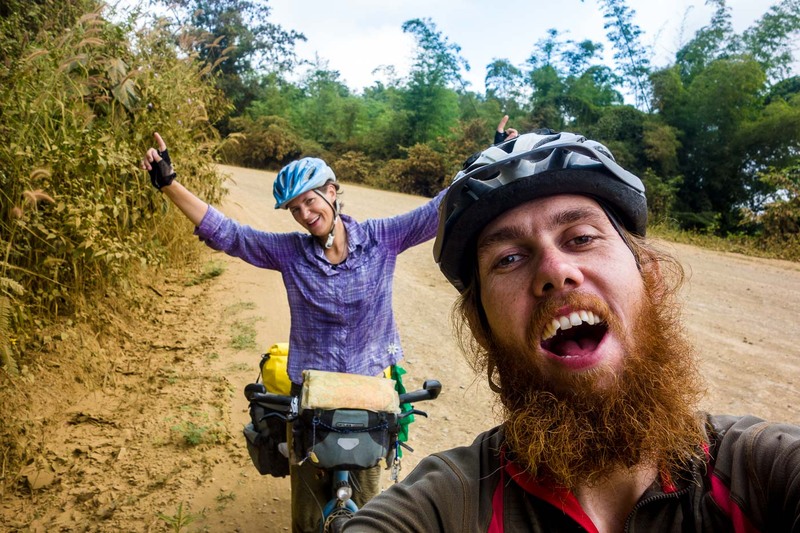 Trisha is an New Zealand artist and author and enjoys traveling by bike, although the Lao heat had her a little overwhelmed. She is a tough lady venturing out on her own while her husband is back home. In Vientiane we also were reunited with Davide by coincidence because we saw his new bicycle outside one of the guesthouses. His previous bicycle had been stolen just after we had both left Dali in China. He had now come from Bangkok where he had purchased his new Surly of which we had seen a photo and instantly recognized it while walking past. It was great to talk stories and see him again. We are curious how many other cyclists we will meet here in South East Asia in the weeks to come!